The big game is coming this weekend! Are you a football fan? 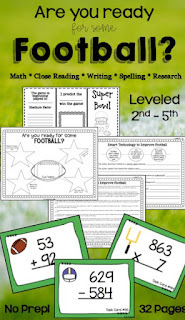 Even if you're not, the Super Bowl has been getting lots of attention in the media, so your students are likely caught up in the football frenzy! And, if you're like us, anything that captures our students' attention means we are searching for opportunities to channel that interest into learning. There are many ways to tie football and the Super Bowl into your curriculum—and in any subject area you teach. use Google Earth to explore Philadelphia, Boston, and Minneapolis; can you find the stadium? Football is a perfect match for science! You can have students connect concepts like force, gravity, motion, and more! There are many STEM projects related to football, too. Here are a few links to get you started. Wonderopolis - What's so super about Super Bowl Sunday? The Super Bowl has a host of math connections! measurement - just how far is 100 yards? more measuring - how far can you kick (or throw) a ball? elapsed time - how long would you travel to get to Minneapolis? Where do we even start?? Well, the best two places are the teams themselves and the famous Super Bowl ads! If you want to challenge your students, check out ThoughtCo's trivia quizzes. 🏈 Finally, if you'd like a SUPER resource with loads of fun cross-curricular activities, here is one we created! We have been SNOWED in and no school for 5 days! 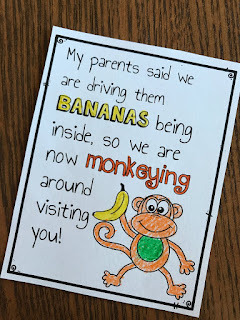 Yes, this mom is going to lose her mind! Snow days are great, at first! I love the sled riding, snow gear, smiles, laughs, and cool air. However, on day 5, I don't want to see any more wet clothes, make any more hot chocolate, or wipe up any more wet snow from the floors. So, today, this mom changed things up. We did a service community project! 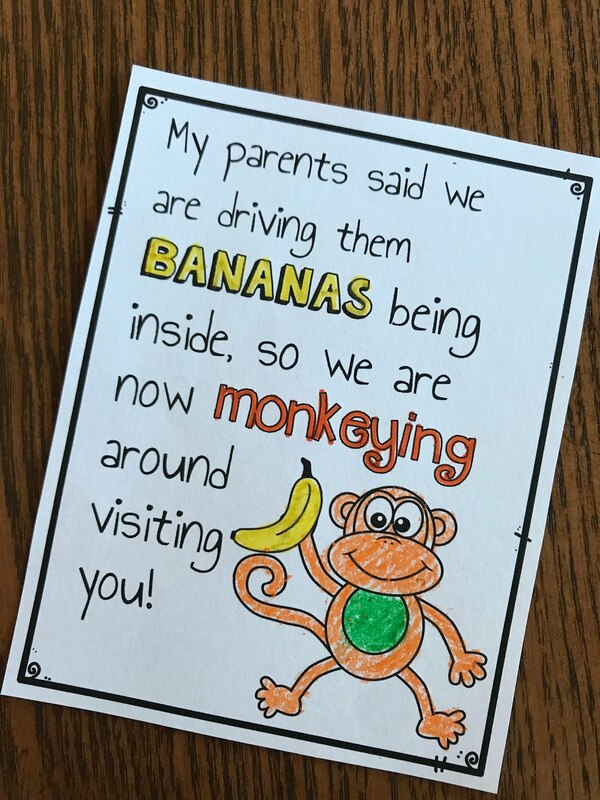 We colored these cute tags that said, "My parents said we are driving them BANANAS being inside, so we are now MONKEYING around visiting you!" 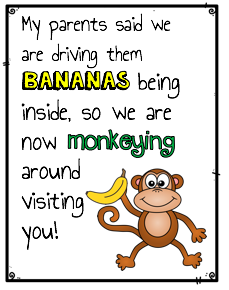 We then bought bananas and visited an assisted living unit to deliver them. The kids loved it, but not as much as the residents! You should have seen the residents' faces! They lit up! The residents wanted to talk about the weather, tell stories about their lunch, or just give the kids a hug. The magic moment happened in the car when we were leaving. My oldest son said, "Mom, that was great. We should really do a service community project every month!" Yes, yes, yes! This is what it is all about! Today was a great SNOW day! I don't know who got more out of it, the residents or my children. Either way, it was a win-win situation! 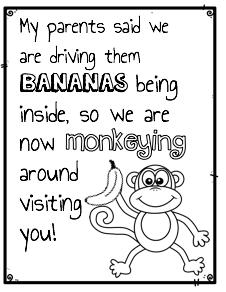 Follow our store, leave a comment below, and you can grab this Monkeying Around Freebie here. You can use the colored one or have your kids color the other option. Both are there for you to use! I hope you enjoy putting a smile on someone's face as much as we did today. It's a New Year! 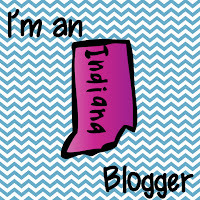 We're pumped to head into a year filled with learning opportunities and chances to grow! Does anyone else get excited to see a calendar filled with....NOTHING?? Seriously, a clean wide-open calendar gives us goose bumps to think of all that will fill our 2018! Already 2018 has come in with a bang! Just a week ago, two of our favorite teachers on the planet have published a book to help share their passion for teaching and learning! And we'll give you the chance to win your very own copy! Now, here's a little background, just in case you don't know Hope and Wade. We had the pleasure of meeting Wade and Hope King at a conference almost a year ago, and believe me, they're the real deal! Their presentation was filled with strategies to keep your students engaged and learning—all demonstrated while standing on chairs, tables, the stage, and sometimes involving a guitar, costume, or mask. The energy level was so high, I'm pretty sure the resort must have received a refund on their energy bill! Have you heard of Ron Clark Academy? This renowned model school is where Hope and Wade practice and share their craft with many students and visiting professionals. The vision of RCA is completely aligned with the vision the Kings have for transforming classrooms worldwide. 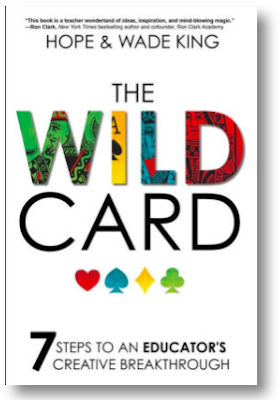 The Kings are now on a mission to share their unique brand of creativity with educators who can't travel to see them in action at RCA, thanks to their new book, The Wild Card. How can DOES this book help me to be a better teacher? 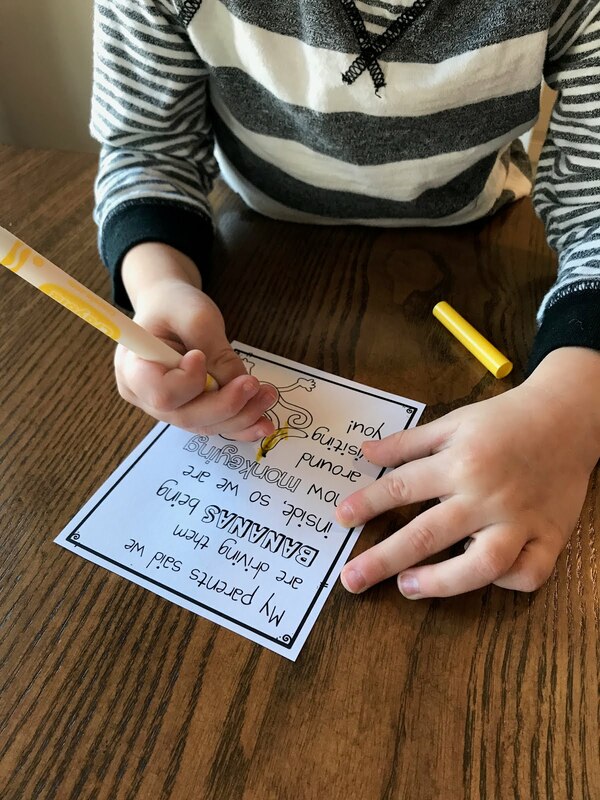 Hope and Wade share so many real-life examples of tapping into their creativity to make sure their students are not just engaged, but also share a myriad of ways to magically transforming your learning environment to ensure that students are totally captivated! They truly show how creativity is the driving force behind student engagement. Do you want to learn more about Hope and Wade's seven-step process to find your own creativity? This book will give you the confidence to create your own memorable lessons and share the magic of learning with your students! Here are just a few one-line wisdoms that had us nodding our heads and saying, "Oh YES!" That's how every single child should feel every single day. If you want to create magic, you must NEVER settle or "good enough," because that's what your students will become. Why be the barrier when you could be the wild card? We could continue quoting this book ALL DAY LONG, but we'd rather get it in your hands so you can feel its magic and use its power to discover how to deliver content creatively. We'd love to send you your very own copy of The Wild Card - all you have to do is use the link below for your chance to win!! In the meantime, we'd love if you'd share (find us on social media and share there—use the #bethewildcard hashtag) to tell us in one sentence about a magical moment of creativity you've experienced in your own classroom! Plus, share a magic moment below in our comments for an extra entry to win The Wild Card. for one of us...it would have to be the "talking box" moment when a box of goodies shipped to us from Venezuela "talked" to the students! For the second of us...one magic moment was when a shy and quiet student felt empowered to take center stage in class by jumping up onto the "stage" in the middle of the classroom to share her thinking in solving a math problem. Thanks to Wade and Hope for helping us to create an environment where our students feel empowered to reach beyond their comfort levels and making them want to be in our classrooms!